As a regular reader of this blog, one may have observed that postings are published on a very comprehensive topic "Complete Shirdi Guide". 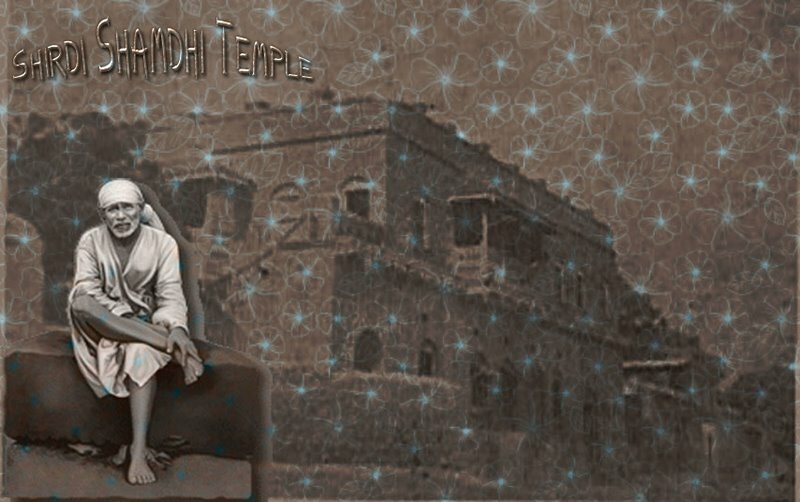 The reason for taking up such a topic which may be found on every blog written on Lord Sai Baba is that lakhs and lakhs of devotees are flocking to Shirdi with an ever increasing flow. The present day environment of Shirdi was prophesied by Lord Sai Baba Himself towards end of eighteenth century. After passing of a century, we realise that the words of Lord Baba are very much true. The prophetic words are already present as a post on another very interesting blog of Lord Sai Baba written by Sai devotee Alpesh Patel under the title Present Shirdi As Said By Sai Baba About A Century Ago. You may like to have a look at it. The words were uttered when Shirdi was not more than a hamlet with no modern amenities, electricity or water. At that time no resident of Shirdi would have thought that the small village in which they are residing under lovable shed of Lord Sai Baba's mercy and grace, will become a center of pilgrimage and every modern amenity will be easily accessible. Before a century, modern technologies and science had not made incredible advancements unlike today. Certainly this may be also the reason that Shirdi was no exception to it besides being a small town of India. As time has advanced, with devotees visiting from every corner of the world, a need has arouse to make available ultra - modern facilities for "Guests" of Shirdi, as "Atithi Devo Bhava" is tradition of our country. Big buildings to accommodate pilgrims, large kitchen with latest technologies for mass feeding, good infrastructure of village, continuous supply of electricity, temple premises equipped with up-to-date security system, online donation facility for donors and much more which can be included in the list, are truely transformations needed. Amongst this modernistic environment of Shirdi, many more changes have taken place which certainly has spoiled gist of ancient Shirdi. Not going too far, as we have read in Shri Sai Satcharitra and other literature of the same subject matter that Lord Baba wore a Kafni which was not washed for many days, begged alms from Five houses in Shirdi, lived in old and drenched mosque named as "Dwarakamai", asked for Dakshina from visiting devotees, distributed all money received the same day and become a poor Fakir. While today we find a totally different scene today. The Samadhi Mandir of Shirdi where sacred tomb of Lord Sai Baba lies is covered almost fully with gold. The throne where Lord Baba's marble idol is placed is also made up of gold. Also a gold crown is adorned on Lord Baba's head and on festivals we find Him in gold from Head to Toe. Moreover Lord Baba's clothes also glitters with gold. When a devotee completely unknown about His life and deeds comes to Shirdi and have darshan in such Gold-y atmosphere he is sure to be deluded. Such a situation seems to be rare now a days because information about anything is now very much comfortably accessible with few clicks on internet. Still a person new to devotion, if reaches Shirdi, gets darshan with all push and pulls. But he ends up his visit with a question in mind whether Lord Baba was really a Fakir? Devotees, in times of Lord Baba wanted a royal paraphernalia for Him, but He never cared for it. Though He tried to adhere to their wishes, He deducted Himself from it at the same time. After Lord Baba took Mahasamadhi, it seems the power now rests in our hands. We never think what pleases Lord Baba instead we do what pleases us. This "Real Gold" does ever require "Worldly Gold" to identify Himself? I think the answer to this by all of us will be in negative. We are delighted to see our Lord in Gold, but never think that how much we are displeasing Him. While on other side, we see that sacred mosque has also been changed completely. Keeping only few things in tact, the sanctity has been disturbed in DwarakamaiThe objects which are in tact are covered with steel rods. We are indeed unfortunate that we were not born during times of Lord Baba, still we must thank Him for He has left so many things for us. But these are also not made accessible to us. Where to go now? The same is situation with Chavadi and many other such places. Instead of preserving the originality of this sacred place, it is being urbanized in every manner. The transformation is demand of time but it should be in such a way that it should not loose original it's gist and sanctity. Last week, i received mail from devotee and writer of the book "I am always with you" - Lorraine Walshe Ryan who visited Shirdi last month sharing her views to commercialization of Shirdi, "I have just returned from a 10 day trip to Shirdi. Whilst in India for a month, every second of my stay was Baba filled,a trip of Joy indeed, but there was also dismay. At Shirdi, I was absolutely saddened at the commercialisation of Shirdi, the sadness in observing people BUYING from shops which surround the Samadhi of my Beloved Baba and all the other sacred places that He is in now and was, people (if they were devotees they would be respectful) instead of standing still while the aarti's were being sung, were shopping. The abject change of most of the sacred sites of Shirdi by the Sansthan, boys fighting outside of the Samadhi area because they were trying to sell things to tourists and others watched them fist fighting and not doing a thing about it, beggars everywhere, are they not being fed? Indeed one has to keep up with the times but keep the sacred sites sacred, keep the shops and the like OUTSIDE of the Sansthan area, feed the poor with all the gold that Baba gets, pave the streets so people can walk on them. When I asked to be granted an interview with the Sansthan I was refused. When I asked to see Wagchure I was told he had retired, but now I see his name written up in your blog. The horror on reading of the Sansthan now turning Shirdi into a TOURIST Centre, is just too much for me to bear. This is not ego writing here, this is not fame or name writing here but the plea of a humble/simple bhakta with a pure heart filled with LOVE for my Divine One, Shirdi Sai Baba. The name Shirdi should not be classified as a Tourist Centre, the name Shirdi when heard by all should bring one visions of the MOST SACRED PLACE ON EARTH, a place of PURE DIVINITY - how dare it be known as a Tourist Centre. I am also saddened to think that people just keep on keeping on accepting the desecration of Shirdi without any objection. Why? I send email after email to the Sansthan on many topics only to be ignored by them - I guess they classify me as a MAD bhakta, not that this bothers me, after all yes, I am mad, mad about my Shirdi Sai Baba. I request you to please put the above on your website so that all those who really love and cherish our Baba, will do something about the destruction of a place so sacred to so many. Such voices should now come up to surface as it is high time. You can share your views in comment box below and i hope any authorised person who reads it may feel to give this write up a practical approach. I agree that in today's world modern facilities are counted in bare necessities, such is the fate of other pilgrims - Tirupati Balaji, Kanyakumari to name a few. But cant we change the fate of our Lord Baba's Shirdi? How about the fact that the trees have been cut all over in spite of the fact that the Lendi bagh looks at all of us right in the face and says - Look this is created by Him. And look at what you have 'created' - mess, dirt, noise. Baba left HIs life as a message - besides the spiritual sayings and doings, this was an important one. Respect Nature. Care for her. All we are now interested is in building malls and walkways to provide shade for the people to wait. Ironically after cutting down the trees which used to do the same thing without any murmur. My entire grouse is about the deforestation and the dirt. Add noise to that. I pray to the Lord to show me a place where the crass modernities do not exist and the place resembles the Shirdi of yore. Of course one needs to build facilities for the ever increasing crowds, but are we not to blame at all? We break queues, shout loudly, talk and litter the entire place. We leave it dirtier than a public toilet. Only sane thing is that the mobiles are not allowed into the Mandir. Imagine if it did. Our bad behavior would come to the fore. Shirdi Baba taught about respecting people, environment. Where do we do that? Om Sai Nathaya Namah. I had a second chance to visit Shirdi only recently with Baba's grace (My 1st visit was a couple of years ago). Things have indeed changed a lot. Commercialisation of the place is rampant. The original feel of Shirdi is losing at a rapid pace. I only prayed to Baba to protect the place and let His connect be not lost. Commercialisation is making it more of a tourist centre. In Q for Darshan a group of 4-5 young men behaved in such a manner that anyone observing them would understand their visit was not to visit Sai Baba but a visit to tourist place, like a resort. This was further evident from the kind of attire that some of them had worn, as though they are taking a morning jog. Om Sai Ram, When I went to Shirdi this time I also observed that spitting was rampant outside the temple. When I questioned a person who was on this act of his, he without any hesitation considered spitting to be normal!! The lane in between sansthan and temple had a lot of hawkers sitting on pavement and the small road was used by vehicles as well, who kept honking for way without any grace. The humble approach which Sai Baba always advocated for is losing its way with the commercialisation. I feel the Government authorities need to stop giving permissions for commercialisation - why would one need a Reebok and Addidas shop at a place like Shirdi. Afterall it is not a holiday retreat but a place to connect one's self to the Almighty. Even Baba's message was to see beyond the material world to attain self-realisation, where then are the people of the day heading! It is only the authorities who can now play a role in preserving the beauty of this sacred place. Sai Knows about this situation. He is watching quietly.It is his shirdi.He knows everything and everybody belongs to him.It is the Kali age & this is what he is showing everybody near his place. True real devotees will find fragrance even in the dust & the changed atmosphere of shirdi. Lastly I really don't like this VVIP dharshan where only a family which has power and money can stand near Baba and get His Dharshan. The lust for money should end. And i'll include this in my daily Prayers.